As regular readers will know there has been some discrepancy between what Royal Mail have announced and what we have been told by other sources regarding today's Post and Go changes. 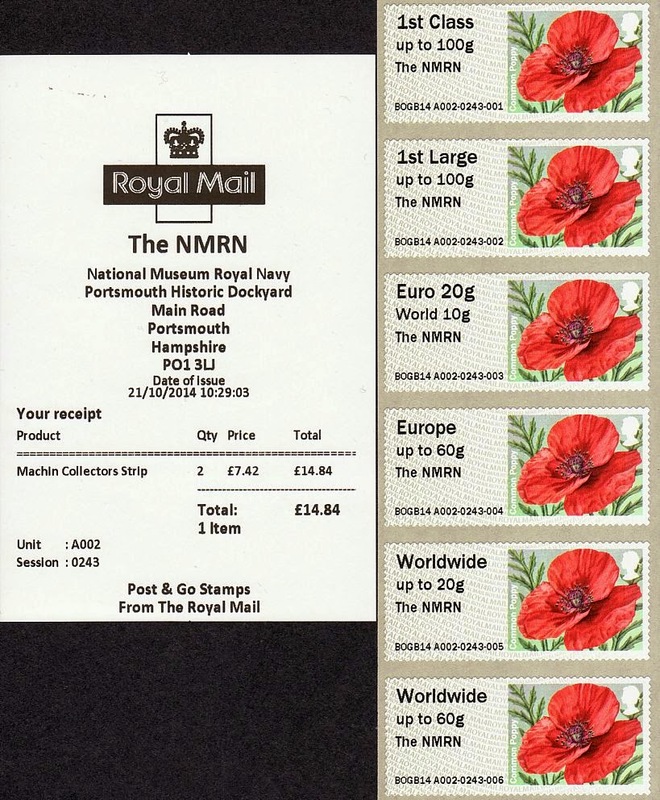 In brief, the machine at the BPMA has been changed so that more than two types of stamps can be sold, and the NMRN machine will have Trafalgar Day inscription on the flag stamps and Remembrance on the newly installed Poppy stamps. Thanks to Chris for this report and the pictures. "Staff placed the Poppy Reel in the machine and it all started well, printing Poppy with ‘NMRN’. Only when someone queried the absence of the ‘Trafalgar Day’ overprint on the Union Flag, was it discovered that the machine had not been updated overnight. "We were assured* that the only overprint on the Poppy would be ‘NMRN’, until 11 November when ‘Remembrance would be added for that one day only. When the software was updated, the ‘Remembrance’ overprint was available immediately! "Only about 900 stamps exist with just the ‘NMRN’ on the Poppy stamp." Chris and Mike have also sent pictures of the four stamps available from the BPMA machine today, showing that (after the Postage Due and Airmail inscriptions) the inscription has reverted to the lower position as it was in 2012. Note that these four are all from session 1546. On these the Machin and Flag are undated, the 2nd class is MA12, with the Poppy being MA14 of course. It's not the same, of course: there have been (too?) many changes in 2 years - the font, the machine number and data string format. But on a simplified level it's the same. ".... I was told by the 'minder' at Portsmouth that the software updates had been timed for 10.30* despite the BPMA having been under the impression that they would be done at 07.01 to allow them to cater for their needs before opening to the public). "RM (or whoever) seriously need to address this so that all PO branches and any other machines are updated before they are timed to open to the public." In relation to the NMRN Poppy only stamp, only 7 sessions took place numbers 0237 - 0243 between 10.03 and 10.29 am. At approximately 10.30 am the software was updated with the corrected 'Remembrance' overprint. As RM monitor these machines, they should be able to provide an accurate record of how many Poppy stamps were issued with this 'Error'. Whether they would or not is another matter. These strips are selling from £150 for the first ever Collectors Strip of this error down to £60 on e-bay. What could be 150 collectors strips of this error is a lot, much more than the Stampex Spring error. The price should come down a lot if people wait. The new Europe 20 g World 10g rate on Wincor machines should be much rarer on some older issues and at least has a need for charging the customer the correct price. 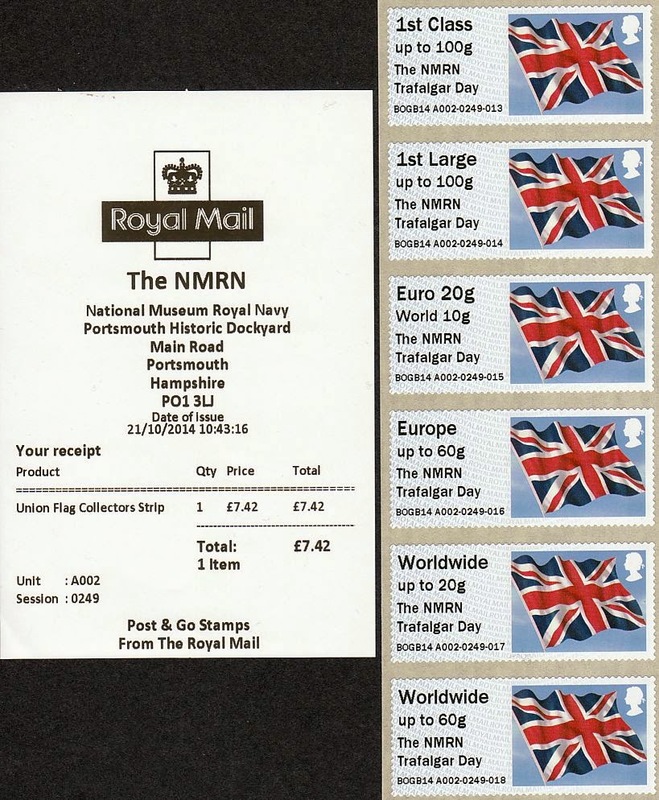 Glad to see the NMRN situation has 'settled down' with a simple choice of Trafalgar or Remembrance underprints, available from their online shop - and none of this 'one-day-only' nonsense! 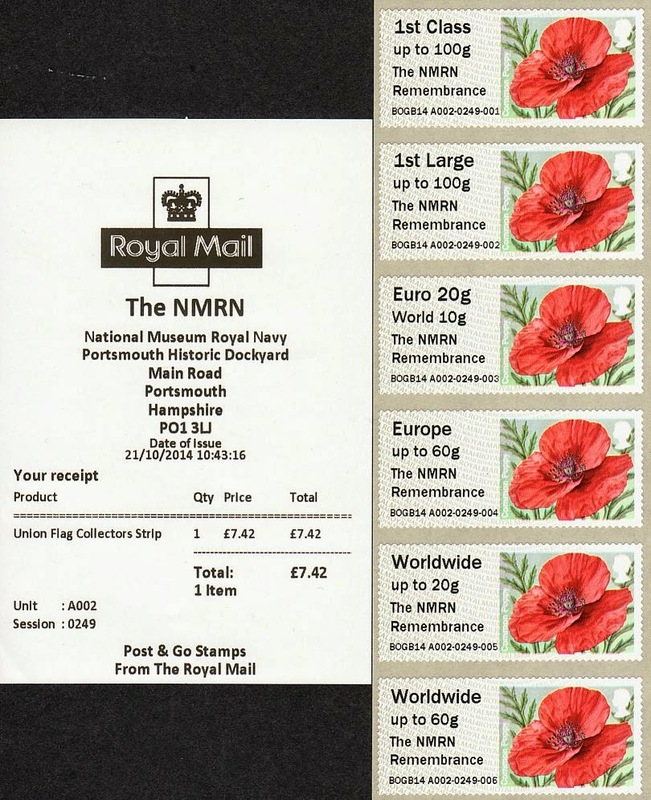 On the high market prices for the NMRN only underprint error, it struck me there is a risk that they will start to issue these after 11/11 (ie without the 'Remembrance' underprint)? Anyway, also wanted to say thanks for the prompt for the 2nd P&G BPMA without underprints - as far as I'm aware the BPMA haven't issued the blue 2nd class pair without an underprint to date - so glad to know before I go for my poppy set! Thanks! HMS Victory gallery, end building opposite HMS Victory. Jersey Post are to bring their JE01 series Post & Go machine to Jersey for the lead up to Christmas. The machine will appear at Jersey’s Lifestyle Show from 7 – 9 November where it will vend stamps featuring Jersey’s first Post & Go design, the Jersey flag, as well as Royal Mail stamps depicting the Union flag. Wondered if Jersey Bureau are selling collector strips from above show,if not how to obtain them?. Have you looked at the website, jerseystamps.com ? I believe that they were only available from stand D51 at the show. No sign of them on jerseystamps website,so may be difficult to obtain,nothing on ebay as yet!.